Rejuvenate Your Skin Naturally Without Costly and Dangerous Surgery! 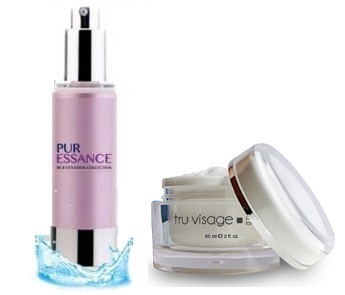 PurEssance is a revolutionary anti-wrinkle and anti-aging face lift serum developed by women for women, backed by 10 years of scientific research and clinical trials. Originally developed by scientists from the University of Amsterdam, it was a by-product of an effort to find a cure for skin cancer. Years of clinical trials showed that the formula couldn't cure skin cancer, but it showed some curious side effects. Over 90% of the women tested showed healthier skin, diminished signs of skin aging, visible reduction in wrinkles and dramatically increased skin hydration. It is truly the only anti-wrinkle and anti-aging face lift serum that is backed by over 10 years of rigorous research. Do you have problems with wrinkles and fine lines? Feeling self conscious about those unsightly age and sun spots? Sagging skin getting you down? You may feel beaten by the battle against aging but take solace for the war is far from over! Discover the power of Truvisage Anti-Aging Formula! Truvisage combines years of research, scientific breakthroughs and powerful, proven ingredients to create a truly revolutionary skin care product. It will help smooth out wrinkles, firm, lift and hydrate to give you flawless skin. Take up to 10 years off your appearance with healthy, beautiful, younger looking skin in only 4 weeks. You will be amazed at the fantastic results! Truvisage – Younger Looking Skin Now! The media bombards us with ads of gorgeous people in magazines, on TV and in movies. The pressure to conform is intense and it is understandable to feel like drastic measures are the only option but this is a false concept. You don’t need painful injections, expensive laser treatments or invasive surgeries to reverse the effects of aging. Not only are they addicting but they can have terrible adverse effects and even lead to permanent disfigurement. Science has advanced far beyond these outdated and highly dangerous cosmetic methods. Truvisage stands on the forefront of cutting edge skin care technology. You will see immediate results from this clinically proven anti-aging formula. Powerful antioxidants will protect your skin from damaging free radicals. Ginseng extract will revitalize and accelerate the healing process. Patented Matrixyl 3000 will boost collagen production. Reclaim your youthful confidence and see the difference this product can make in your life! Clinically proven results to reverse the aging process at the cellular level. Proprietary Biosphere combined with our patented delivery system creates a heavier molecule which enables the active spheres to make penetrations to the deepest layer of the skin. The walls of the penetrating Biofil spheres are made up of natural wheat protein. This allows for a more sustained release of nutrients, and the wheat acts like a sponge that captures trans-epidermal water loss, resulting in wrinkle reduction. I used this for a month a saw a big difference in my skin. I will recommend this product to my friends.